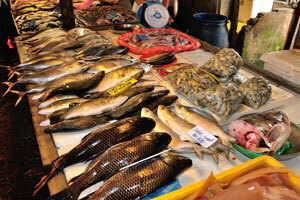 A wide variety of fish and seafood products is available for customers on Chow Kit wet market. 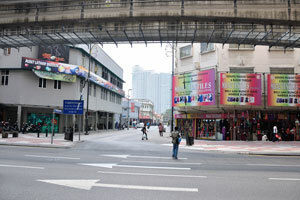 View of the Chow Kit Monorail station from the Chow Kit wet market. 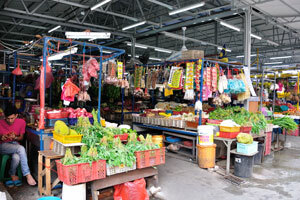 Chow Kit wet market is located on Jalan Tuanku Abdul Rahman street. 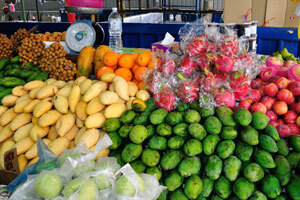 Fabulous colours of the fruits and vegetables. 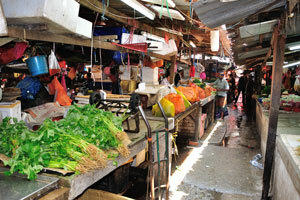 I like to wander in the cities and watch the locals markets. 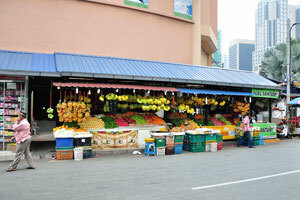 Chow Kit wet market can be easily reached by KL Monorail, the name of the station is “Chow Kit”. 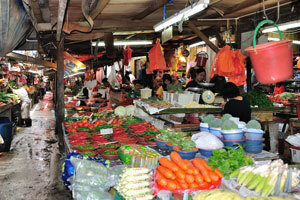 This magnificent market is named after the district Chow Kit. 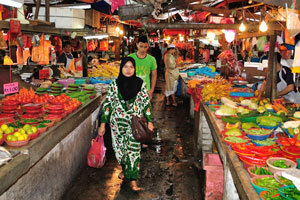 It's the largest wet market in KL. 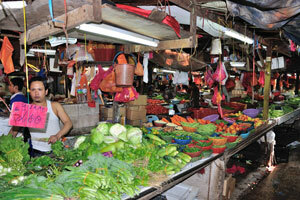 Narrow pathways go through maze of stalls full of fish and meat, fruits and vegetables, spices. 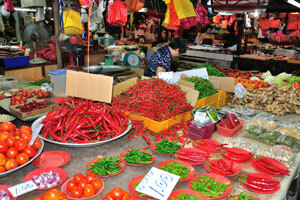 You can't resist the urge to buy smth because of the colours and fragrances that dominate the market. 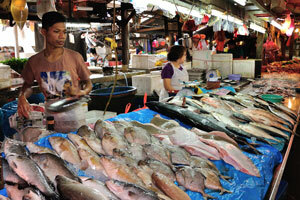 Chow Kit wet market is chaotic, vociferous, smelly and dirty as a real market should be. 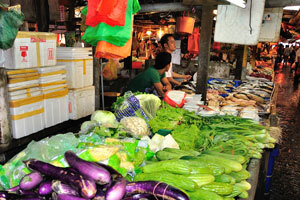 Chow Kit wet market has everything you could want to eat, from fruits and vegetables to fresh fish. 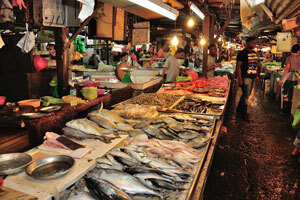 For anyone who enjoys the sights and sounds of a bazaar, Chow Kit wet market is a real pleasure. 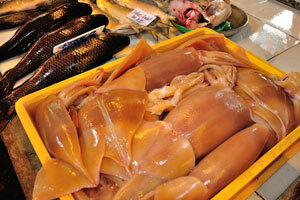 There is a good diversity of fresh fish and squids in the market. 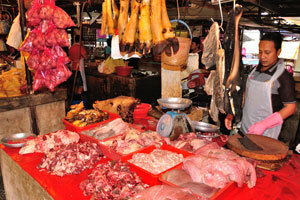 Bizarre views and smells of the meat, poultry and game are everywhere in the market. 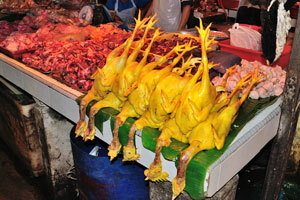 Being an awesome place for unusual photographs, market has the fascinating meat and poultry stalls. 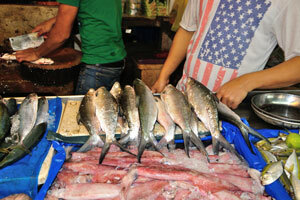 An amazing place to see a real glimpse of Asia, market is full of fresh fish. 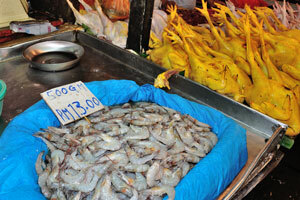 Fresh prawns cost 13 Malaysian ringgits per half a kg. 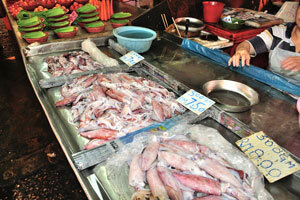 Fresh squids cost from 7 to 8 Malaysian ringgits per half a kg. 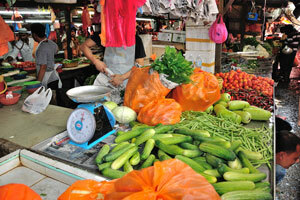 Exotic vegetables, an abundance of fresh produce and a stunning array of weird and astonishing things to eat. 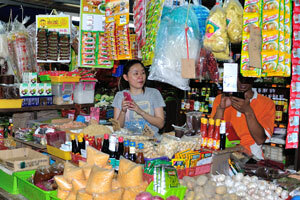 Much of the clientele at the Chow Kit wet market is Malay or Indonesian. 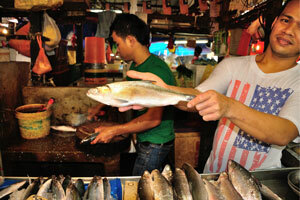 Fresh fish cost from 4.5 to 5 Malaysian ringgits per 500 grams, it can be cleaned right in the market. 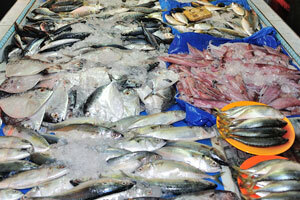 Selar Tempatan costs 5 RM per 500 grams, Tilapia costs 12 RM per 1 kg, Tuna costs 3.3 RM per 500 grams. 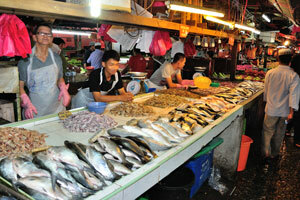 Frequently there's water on the pathways, because sellers splash the fish with cold water to keep it fresh. 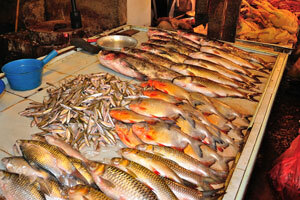 We had bought four fish of this kind in this stall and courteous sellers cleaned it for us. 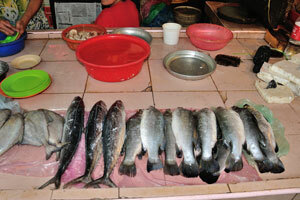 We had been waiting while the sellers cleaned the fish. 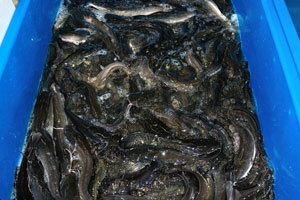 Fresh eels and seafood shells for sale. 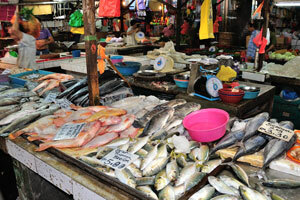 Chow Kit wet market is also the place to try local products, for example, we have bought some fish. 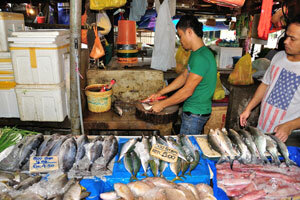 Sometimes the sellers use ice cubes to cool the fish and seafood. The floor is wet! 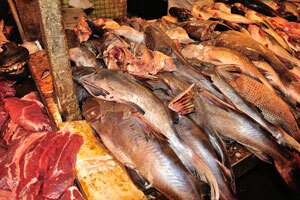 Large specimens of fish and huge pieces of meat for sale. 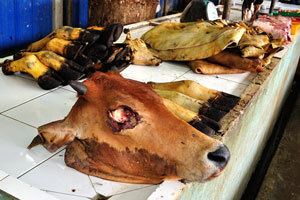 Smoked cow heads is also available for sale. 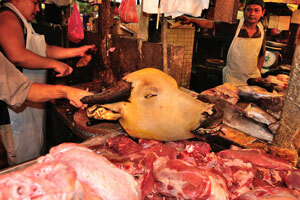 Not for the squeamish! 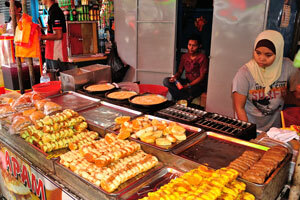 While some may not like the smell and wet floor, this market is a way to experience a Malaysian market. 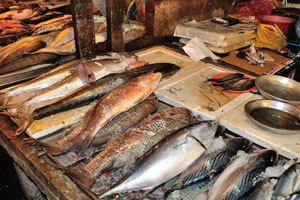 This place is wonderful we loved seeing all the locals selling and purchasing fish, poultry and raw meet. 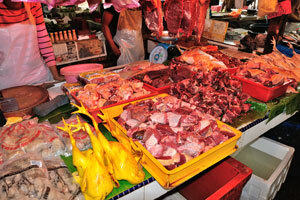 The produce is fresh, colourful and the variety is on display: raw meat for sale. 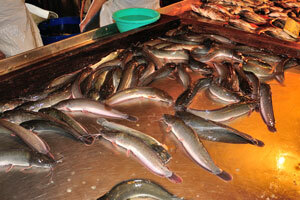 You could not get your fish fresher than that wriggling on the table after being gutted. 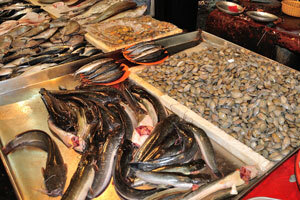 The amount of unusual and bizarre food is unbelievable, everything from cows heads to live eels. 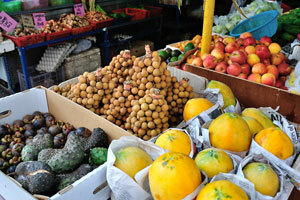 Fruits variety on this photograph consists from grapefruits, apples and brown lychees. 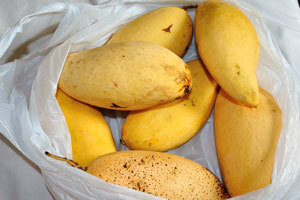 Mango is a real pleasure for my eyes and stomach, so we had bought several kg of mangoes here. 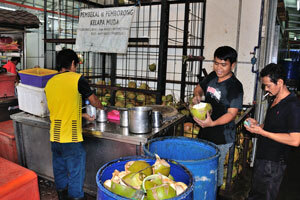 You cab buy fresh coconut juice in the “Pembekal & Pemborong Kelapa Muda” shop. 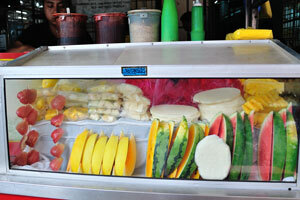 Slices of apples, mangoes and watermelons for sale. 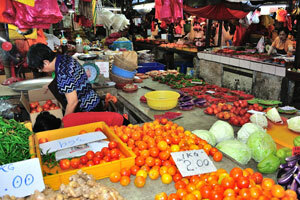 “Jual Santan” shop sells the great variety of fruits. 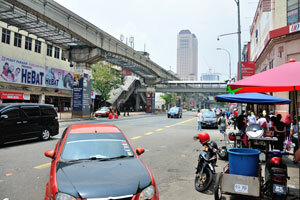 Even in the afternoon the sun is not a problem here, because the pathways are covered by roof. 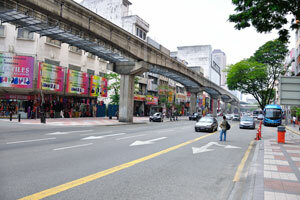 Monorail goes along the Jalan Tuanku Abdul Rahman street. 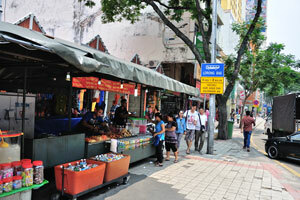 We are on Jalan Tuanku Abdul Rahman between Chow Kit wet market and Chow Kit monorail station. 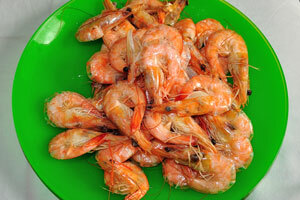 After we had returned from the market to the hotel we cooked the prawns. 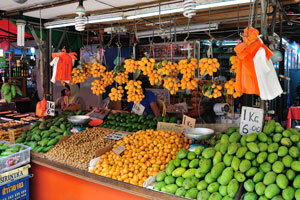 Fragrant mangoes from the Chow Kit wet market have a gorgeous taste. 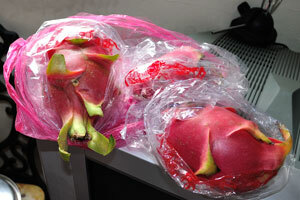 White-fleshed Pitahaya “Hylocereus undatus” is a species of Cactaceae and is the most cultivated species in the genus.